We’ve also been spending more time cooking at home on the weekdays than we used to back in New York, where our offices were much more prone to late nights and dinners at your desk (B2’s old firm had a table devoted to Seamless drop-offs in the lobby!) Here, the days — even the busy ones — start earlier but they end earlier, too, and we’ve been delighted with this new life where any work left in the evenings can be done at home, and we can have dinner at home with sunshine streaming in through the windows. 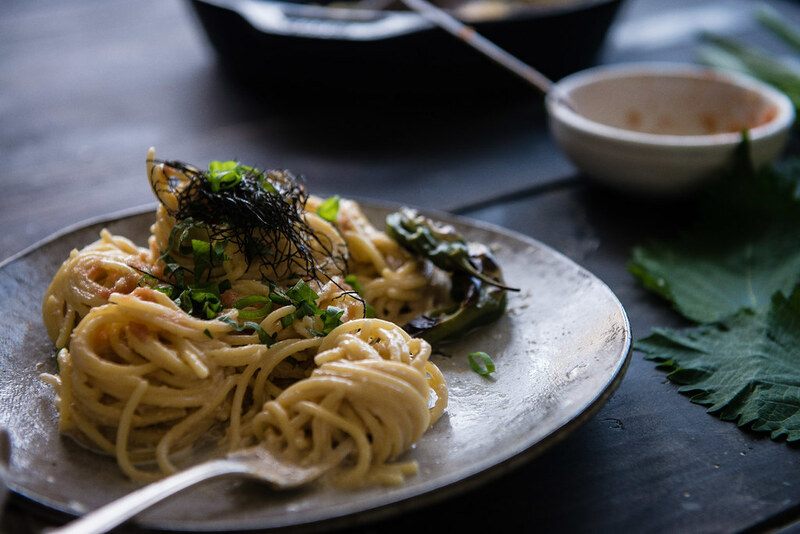 Still, cooking more often and cooking on weeknights means meals like this mentaiko spaghetti, that are simultaneously easy and quick but exciting and not too repetitive, have become favorites of ours. I first had pollack roe when B2’s mom introduced me to myeongran jeot, mixed into warm rice and scooped up with sheets of sesame-toasted nori. This first venture into fish eggs outside of the smattering of tobiko on sushi rolls was magical to me — just a few tablespoons turns a whole bowl of rice salty and comfortingly flavorful, with a vague taste of the sea from both the roe and the nori. When we sat down last year at a Japanese-Italian restaurant in Tokyo on Stephanie’s recommendation and I spotted mentaiko, or myeongran jeot’s Japanese counterpart, in spaghetti, it was love even before I’d had my first bite. 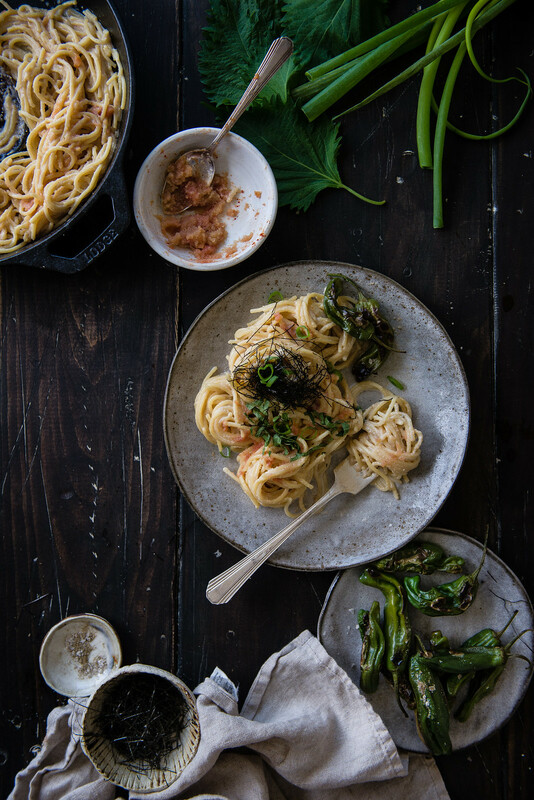 For a meal that feels so unique, mentaiko spaghetti is actually beautifully simple to make at home — it’s nothing more than piping hot pasta, tossed quickly with salty, gently spicy mentaiko and a generous helping of good butter until each spaghetti strand is coated brightly in butter and roe. Then it’s loosened with just a bit with starchy pasta water, or, if you like, a bit of cream and milk, and topped with finely minced shiso leaves. I had been tempted to discount the shiso, but its lively pepperiness, almost like basil, is what really brings the dish all together. Provided you can find a little package of mentaiko and a few shiso leaves at a Japanese grocery store on the way home, the time it takes to cook the spaghetti is all you need before it’s time to eat. 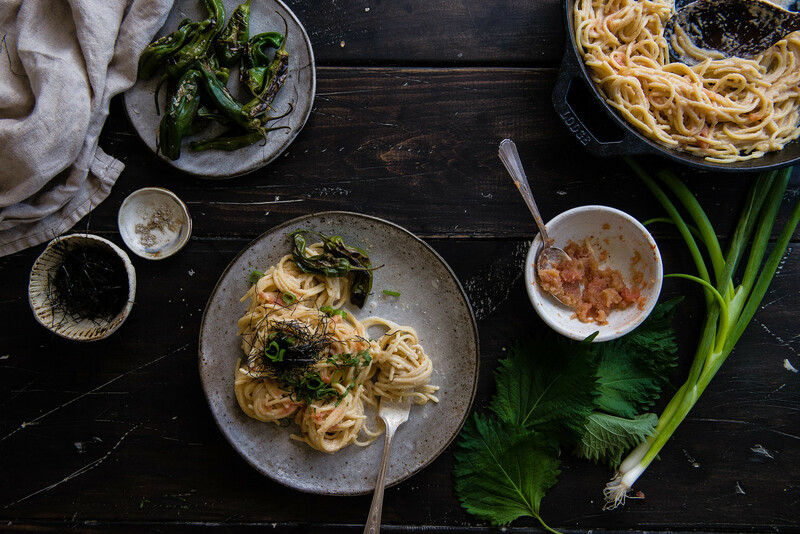 There’s a nearly spot-on Italian equivalent in bottarga pasta, but mentaiko spaghetti somehow reminds me of a briny, sea-breezy version of cacio e pepe, with fish roe providing the umami punch in place of Parmesan, and with shiso as a fresh stand-in for pepper. Granted, I think it’s best suited for someone who loves seafood, or anchovies on their pizzas (and B2, who doesn’t like either, is probably much more excited for our taco salad nights). If you do, though, there’s nothing better for a weeknight meal. Bring a medium pot of well-salted water to boil. Cook the spaghetti according to package directions. You may want to cook it just shy of done, to slightly al dente, since you’ll be cooking the pasta just a bit longer in the sauce. Meanwhile, cut open the mentaiko if it came with the membrane sac intact. Scrape the mentaiko roe off the sacs and discard. Once the spaghetti is done cooking, drain -- reserving 1/2 cup for thinning the pasta -- and add the spaghetti back to the pot over low heat. Add the roe and butter, and toss quickly until the butter is melted and the roe is evenly distributed. Add the soy sauce and toss again, then thin the pasta to your liking with the reserved pasta water, a few tablespoons at a time, until it reaches your desired consistency. (You can also use cream and milk; see Notes.) I ended up using about 1/3 cup. Divide between two bowls and top with minced shiso and shredded nori, if using. Enjoy immediately. If you have access to a Korean supermarket but not a Japanese one, myeongran jeot (often labeled pollack roe) will provide a close substitute, as will perilla leaves for the shiso. Both Korean and Japanese pollack roe can get pricy, but you only need a small amount for the pasta -- I picked up a 2 oz package for around $3. 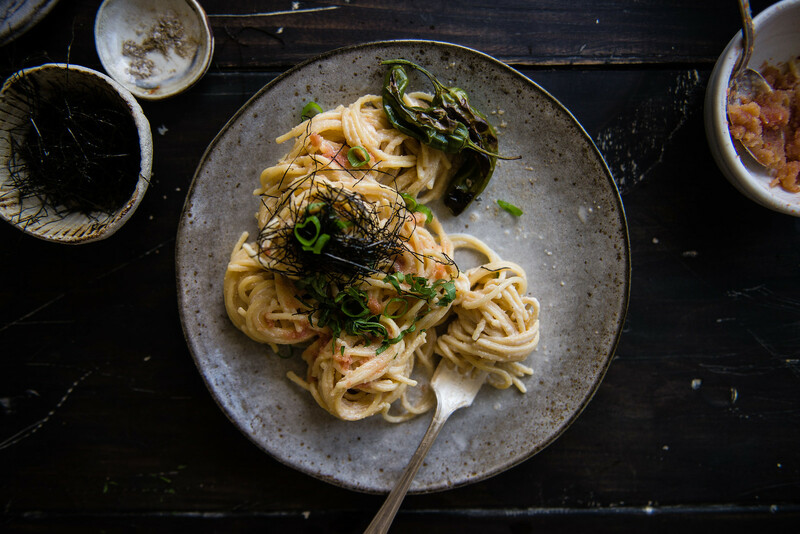 If you want a creamier, more alfredo-like pasta, use 2 tbsp cream and 2 tbsp milk to thin the pasta after adding the roe and butter. You may still want to thin it with a bit of pasta water, as necessary. Lastly, I served this with some blistered shishitos -- all I did for them was heat a cast-iron skillet over high heat, add the shishitos and let them cook until charred, then toss them with a bit of olive oil and coarse salt. Haha!! If B2’s childhood antics are anything to go by, I think we’ll definitely be chasing him around the house. Thanks for always making me smile, Erica! Sounds like life over there is pretty decent! What a great weeknight meal. I like to make shad roe in the sliding and you have to actually cook the roe sacks and remove the eggs. Pretty visceral but so yummy. How you’re doing well and furniture shopping is going well and all that good stuff! Ha, “visceral” is totally the right word for it. Those sacks make me laugh every time. I’ve never had shad roe — will totally add it to my list! Oh yum. I’ve not heard of mentaiko, but it’s good to hear that it’s similar to bottarga. I love seeing the dishes you pull together with unfamiliar-to-me ingredients- it’s such a wonderful reminder of all the good things out there. This looks excellent, and I’ll have to make the track to my local multi-cultural Asian market to make this. This is so kind, Allyson — thank you! BAHA but fishy popping boba is so apt! And I totally agree that butter and soy sauce is a combo made in heaven 🙂 Thank you, Heather! japanese fusion pasta is the absolute best!! i love this quick weeknight dinner. i’m going to go get some mentaiko stat! I was thinking of you when we had this!! Hugs to you, Steph! I just love fusion food. 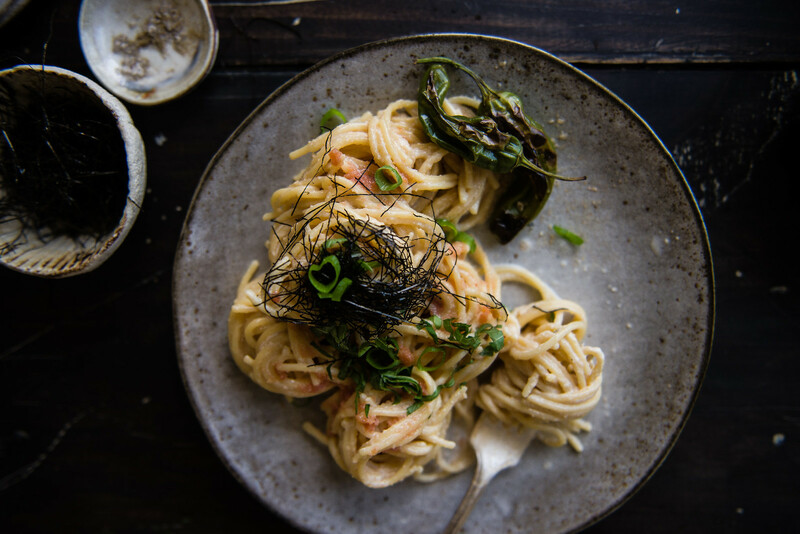 I occasionally make pasta with Indian spices and this spaghetti in Japanese flavor sounds quite interesting! 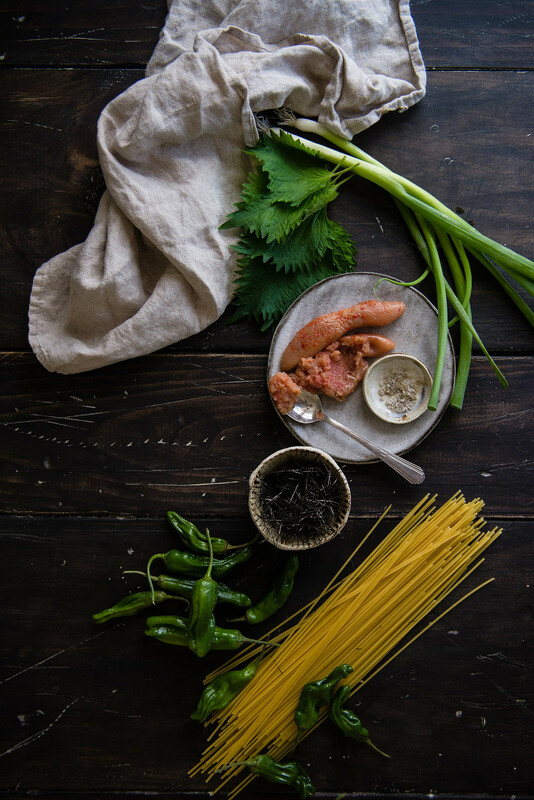 Pasta with Indian spices sounds amazing. Thank you for stopping by, Kankana! Yum, I never thought to fuse Indian spices and pasta but that is brilliant! Mentaiko spaghetti is one of my favorites! When I was growing up and would visit family in Japan I would get as much mentaiko as I could. When it’s gifted from friends it’s quite a treat. Sadly here in NYC I haven’t been making it from scratch… Will get a move on it. Thanks for the recipe! OooOoo! I was going to ask you if you’ve tried myeongran joht but glad that you have! It is one of my absolute favorite side dishes ever….I could eat so much of it with just rice, and trust me, I’m not a huge white rice person either. I still can’t get off my mind that dreamy mentaiko udon from Marugame. I should just make my own, huh?? I had to come back over and tell you… Remember your motion to squash? I just wrote in an email “attached is the witness prep menu”. I meant memo and caught it before it went out. Thought you’d get a kick out of it. HAHA! This made my day (but I’m glad you caught it!) The things we do when it gets late… I hope you got home at a decent hour, friend! This is one of the most famous courses at N/Naka in LA. Fabulous! This looks so good! There is a Japanese market somewhat near where I am, but most of the time I don’t even know what to buy there! Mentaiko sounds completely foreign to me, but I’m excited to try this recipe! This looks awesome, I wish my food looked this good!